It’s no secret, I love finding a good bargain in a charity shop. I also make no secret of the fact that I love high street and online shopping. I delight (and I use that word in all of its glorious meaning) in finding something that I love, whether it’s expensive or cost a couple o’ quid. My good friend Katie, from lifeonvista lusciously calls it ‘the jiggles’, finding that one thing that makes you squeal with giddiness. Like this. My wardrobe is a mismatch of brands, quality and price. In the plush confines, you’ll find Jaeger nestling with Topshop, whilst Yumi chats with ASOS. Meanwhile, Zara and H&M look on. In the cheap seats, you might find the odd Primark piece hung with supermarket greats: George, F&F or TU. What I’m trying to say, in a lyrical way, is that my collection of clothes are drawn from a range of brands and places: high street shops,charity shops, online sites, blog sales, eBay…you name it, each ranging in price. These days, I’m beginning to shop according to taste, need and quality. I’ve certainly not perfected the way I shop, I buy way too much, but I’m learning to be more selective and make better choices. I shop more in charity shops than I’ve ever done, as my disposable income shrinks I’m happy to be making a sustainable choices that support my bank balance in return. So, when you’re on a budget or making a sustainable choice, how do you get the jiggles from shopping in charity shops? In this post, I’m hoping to share with you how I find quality pieces that stand the test of time. Sure, we love support a charity. It makes us feel good, especially when we’re reminded of how vital these shops are for a charity to survive or by slogans such as, ‘Shopping funds research’. However, if we’re not careful, it’s easy to suffer from what I call, ‘The Primark Syndrome‘. The sense of, it’s cheap therefore it must be a bargain. You may wear it if you lose/gain weight, or you have one just like it that you love. Whatever the reason, the first thing you must consider is, do you really need it? Before leaving the house, make sure you know what’s in your wardrobe and most importantly, what’s not. Case in point: Last Thursday, I went charity shopping my local town. 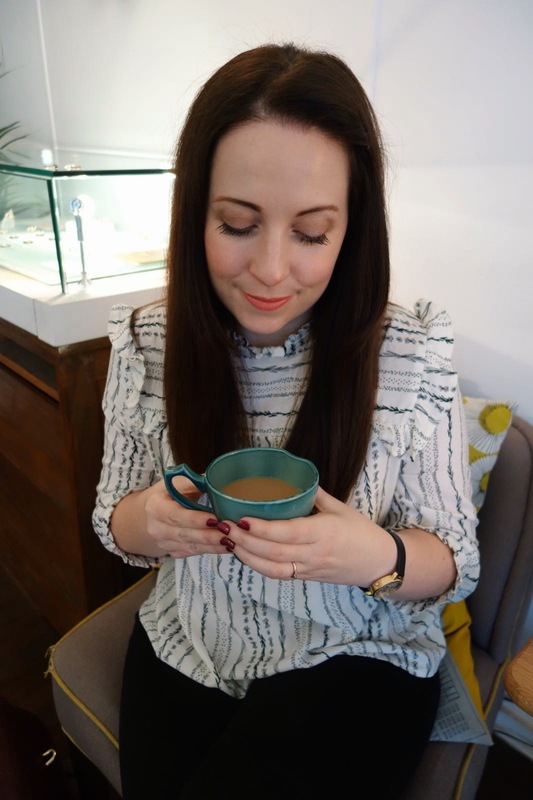 I needed knitwear and transitional dresses to take me through to autumn. Three shops in, I found a retro a-line cotton skirt from Hobbs. It was £3.79. It was what I had needed all summer. The print was in the style of Orla Kiely and it fit like a dream. Did I buy it? No. Was it a bargain? Without doubt. It took me 15 minutes to decide against it. Why? A cotton skirt just wasn’t what I needed right now. Shop a charity shop like a high street shop. Make a beeline for the things that you need. 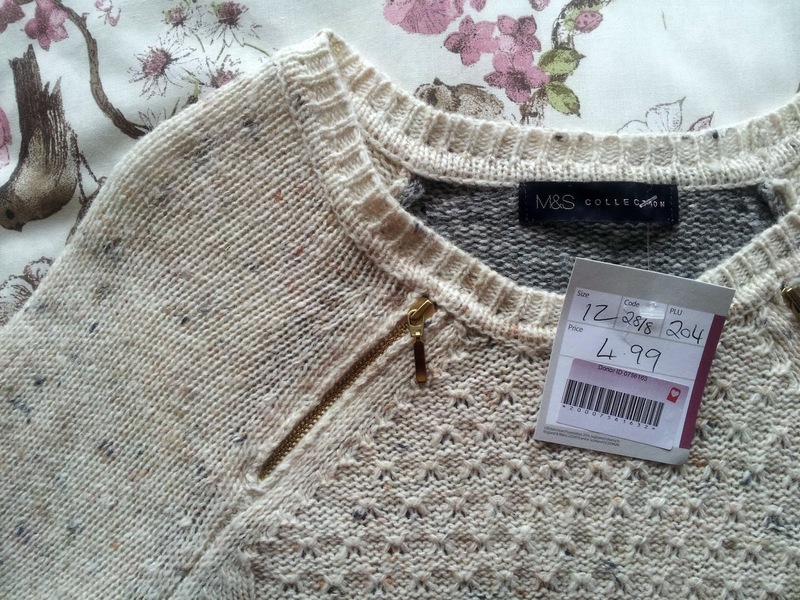 An M&S jumper, like new, with 14% wool content. You’re expecting me to talk about Primark pieces here, non? I’m sure overpriced Primark clothes are a bug-bearer for all charity shop lovers. Instead, I’m talking about quality and price per wear. 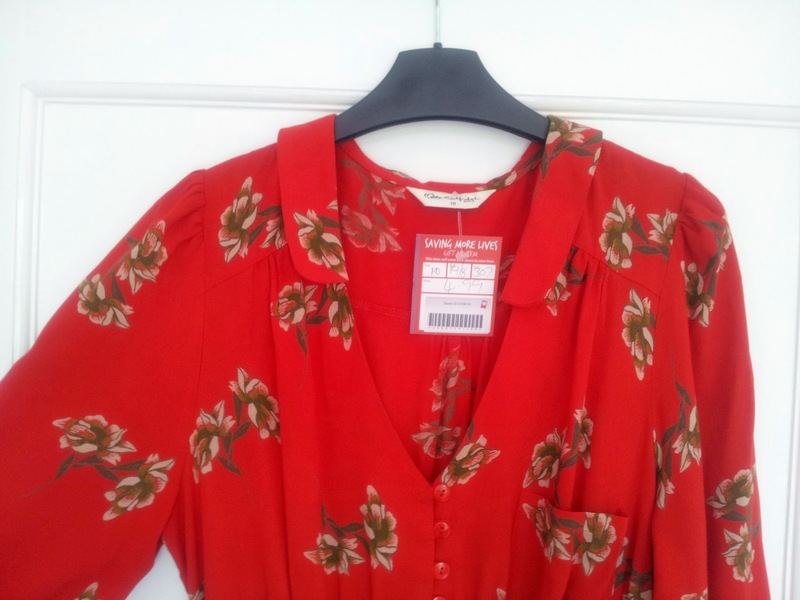 Sometimes, charity shops will ask more than we’d expect, but what’s it worth to you? Look for signs of wear, is it well-worn or like new? If it’s like new, I’m happy to pay more if it’s what I need. If it’s not like new, I consider how much wear is left in the garment and what I’m willing to pay. Put simply, take someone who enjoys charity shopping. Quite often, I’ll nip into charity shops with John whilst we’re out. He’s a good ‘un, he doesn’t mind coming in with me but it’s definitely not his thing. If I find something I like, it quite often goes like this, Me: ‘What do you think?’, John: ‘It’s alright’ or, ‘Yuck’ if it’s really not to his taste. So, I always go with one of my closest friends. We know each other’s tastes so well by now, we’ve been friends since primary school, and aren’t frightened to give our honest opinion. Quite often, we will pick out things for each other that are spot on. Try before you buy. Most charity shops having changing rooms these days and are happy for you to try things on. I’ve often found a brand I wear regularly in my size and tried it on to realise how different sizing can be. Case in point: Again, last Thursday, I found a pretty bottle green dress with cream polka dots. Perfect for autumn. It was made by Mela Loves London and was a size 12. I tried it on shortly after the Hobbs skirt, just as a precaution. It was so ill-fitting on me I realised why its previous owner had given up on it. Some charity shops will offer you an exchange on non-suitable items, however I like to shop in different areas and can’t guarantee that I’ll return within a suitable amount of time. Before I step foot in a charity shop, I check my balance and withdraw what I’m prepared to spend that day. Usually, it’s around £20. Personally, it’s what I can afford and what I’d happily spend in a high street store. Know what you are personally happy to spend on that day, what suits your budget. Most of all, I can’t stress enough that charity shopping for me is always about having fun and feeling good about giving back. On most visits, I will donate a bag of clothes, it’s important to me that I don’t just take. You never know, that unwanted dress could give someone else the jiggles. On a serious note, by shopping in charity shops you are supporting the valuable work that they do on a daily basis and I hope, helping to make change.